The Saracens are a strong anti-cavalry team. Their Camels and Mamelukes can have extra Hit Points and can take out a team of paladins easily. They match up well against teams with superior cavalry like the Byzantines and Franks. Another advantage they have is the quick attack speed of their navy. This small perk overwhelming increase accuracy of ships giving them a naval powerhouse. Their weakness lies in their cavalry but their camels make up for them. The Mamelukes are a perfect counter to Rams and siege weapons. The Saracens do not have too many weaknesses making them one of the top civilizations in the game. The best strategy to use is build armies of camels and Mamelukes. Cavalry Archers are optional since mamelukes act like ranged units by throwing their sabres. You’ll need to advance quickly so have infantry for protection in the early game. Build a navy if you can and have them patrol the shorelines or annoy enemies by keeping them inland. 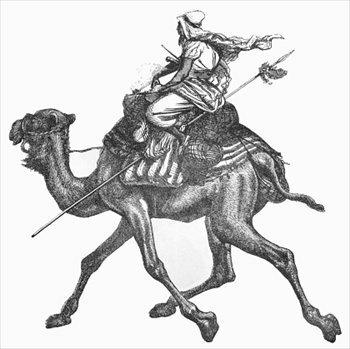 Mamelukes, or Mamluks, were camel riders of the desert. They originated from slave origins and earned respect as warriors of the Islamic movement. Like the crusades, the Saracens and their Mamelukes invaded Europe from Africa to conquer Christian Spain. Mamelukes used lances and sabres in combat and would occasionally throw them at deadly accuracy. The curved sword developed over time into a perfectly engineered throwing weapon and it became known as the Mameluke sword.